Just like the discovery of fire, we are rapidly approaching yet another seminal point in human history. For years we have imagined the existence of Artificial Intelligence through films, books and other media. However, what was once only a glint in our eyes is rapidly threatening to become a reality. As more and more companies have started investing heavily in AI development, we are slowly becoming cognizant of how much this technology has to offer. Some of the biggest technological corporations in the world like Google, IBM, Nvidia, etc. are researching and using machine learning, deep learning and AI technologies to solve problems in ways not possible before. Corporations are now acquiring private companies working to advance AI technologies at an accelerating rate. The most notable of these was Google’s acquisition of DeepMind in 2014 for upwards of $600 million. 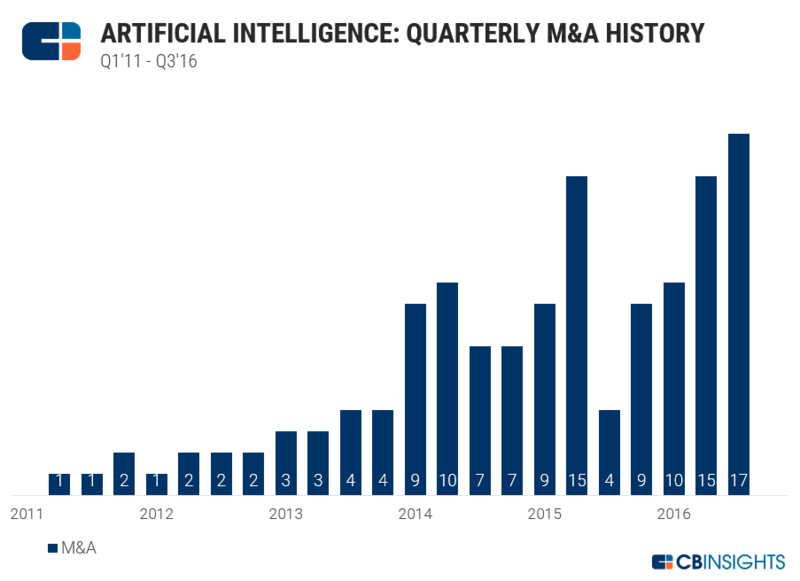 In fact, between Q1 2016 and Q3 2016 alone, there were already 42 mergers and acquisitions of AI development companies. For context, there were 37 mergers and acquisitions in 2015 and only 58 mergers and acquisitions from 2011 to 2014. This a clear demonstration of the fact that more and more companies are realising the potential of AI and investing heavily in it. Realising the enormous potential of AI, tech giants have been investing heavily in innovations and startups that are powered by AI. Almost all leading brands, including Google, Apple, Microsoft, are eyeing on a sizable share of the AI market in the next 405 years of time span. Among all, however, there is one man who is committed to lead from the front. No prize for guessing it right, it’s tech wizard Elon Musk. But before we discuss how his new venture might take the interference of AI in our daily life to a whole new level, lets touch base of the overall impact of AI. The Job Market – The emergence of AI will completely overhaul the job market. The conversation around this issue has been quite controversial, with many believing that AI will create a lack of jobs. A report by the World Economic Forum estimates that nearly 5.1 million jobs could be lost by 2020 in 15 leading global economies. On the positive side, however, the deployment of AI will also help in the creation of 2.1 million new jobs in specialised fields such as Computing, Math, Architecture and Engineering. This suggests that while AI will not eliminate the need for a human workforce, it will reshape the job market and skills required to thrive in this new market and give rise to a new class of professional. A report by Infosys also outlines rapidly increasing revenue associated with AI adoption. Autonomous Cars – Led by tech entrepreneur Elon Musk, there has been an explosion in the autonomous driving technology of late. The dream to make every vehicle completely driver-less is looking more and more like a reality with each passing day. The benefits of this technology are tremendous. Substantially lower accident rates, eliminating traffic congestion, lower fuel consumption are just a few of them. Also, this could help enhance human productivity in terms of time savings. The basis of this technology is AI; the brain that drives autonomous cars. As AI technology evolves, we can expect driver-less cars to become the norm slowly. Digital Advertising – AI technologies have already started changing the traditional norms of digital advertising. Social media giant Facebook uses its deep learning AI to understand its users’ preferences better. This ultimately allows for more personalised services and advertisements. Digital Virtual Assistants – As we previously reported, the AI-powered virtual assistant industry is experiencing explosive growth. Tech giants like Apple, Google, Microsoft, Samsung, etc. are now investing in technology that could net revenues of nearly $15.8 billion by 2021. The industry opinion seems to be that VDAs are how humans will interface with technology in the future. Enhancing Human Cognitive Abilities And Memory – There are many benefits that can be derived from treating the human brain as a computing platform. Brain implants could supposedly help our ability to perform complex mental tasks and improve memory functions. By removing brain-computer I/O bandwidth restrictions, such implants could also help in faster and more accurate communication, as well as interfacing directly with the Internet and cloud. Treating Disease, Dysfunction And Other Health Benefits – Another huge benefit of these implants can be to the healthcare industry. Kernel and its team of neurosciences are attempting to use similar technology to reverse the effect of neurodegenerative diseases. This can be done to ameliorate the effect of Parkinson’s disease, depression, epilepsy, anorexia and more. In the long run, this technology can also extend the human life span. Despite the immense promise of this type of research, many hurdles need to be overcome before it can become mainstream. The biggest constraint at the moment is our limited understanding of the human brain and its communication protocols. Neuroscience has to progress to a point where we have sufficient knowledge to attempt such a brain-computer interface. Another issue is one of human testing. Brain surgery is incredibly invasive and dangerous. This is why very few people in the world have complex implants inside their skulls at the moment. We cannot accurately speculate as to how many of AI driven technological innovations will turn out, or when will it reach to maturity level. What we can be sure about is that the AI revolution is coming, and it’s going to change the world – for either good or bad.